(click to enlarge)Among the stars in your community, Macy’s has discovered the shiniest! 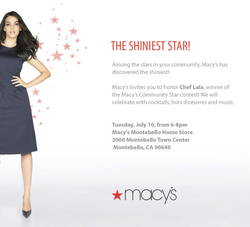 Macy’s invites you to honor Chef Lala, winner of the Macy’s Community Star contest! We will celebrate with cocktails, hors d’oeuvres and music.